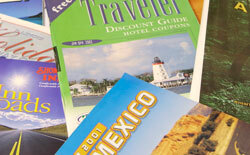 Marketing collateral is a term for a collection of media used to support the sales of a product or service. Marketing collateral is generally used after a company has made initial contact with customers through advertising or other means. Marketing collateral frequently runs parallel to your company's primary advertising and often contains a call to action. It should be designed to explain details of your products and services and provide compelling reasons why your customer is making the right choice. Why is marketing collateral so important? They tell customers who you are, and what you do. Marketing collateral helps build your brand, and they assist salespeople in moving customers through the sales cycle. All marketing collateral should visually reflect your company's corporate identity and should be written in a consistent tone. Customers considering buying a product or service usually have a problem they need to solve. Write copy with the consistent message that your company will solve these problems. Your materials need to have a statement of features and benefits along with clear, simple instructions on how to place an order.